Close reading is a strategy where students read a passage multiple times in order to gain a deeper understanding of the text. When I first attacked close reading with my students, there was a lot of complaining. They didn’t understand why they had to read a passage more than once and I didn’t exactly know what I was doing. It was boring…for me and for them. That’s when I decided to dive into some research on close reading and came up with some modifications to make it more enjoyable for us all. We used highlighters to mark up the text along with markers and colored pencils. It made the text look fun and colorful when we were done. Instead of just using text symbols you could color-code your annotations. Sometimes, we would use markers to mark each question in a different color. Then during one of our readings, typically the 2nd or 3rd, we would underline or colors the text that helped us answer that question. Other times, we would take our Post-It tabs and mark the different parts of the text with those. The students love it! Next, the passage you choose for close reading is very important. It should be a grade level or above text that presents a challenge to the students. My most successful close reading sessions were when using passages that were of high interest to the students. If it’s near a holiday, we use the passages found in this Holiday Close Reads Bundle. They provide the perfect practice while engaging students in text about specific holidays and traditions. Lots of students actually don’t know the history behind many holidays that are observed. They found these passages to be interesting and they learned something new about some holidays. They also help to clear up some misconceptions some students have about certain holidays. 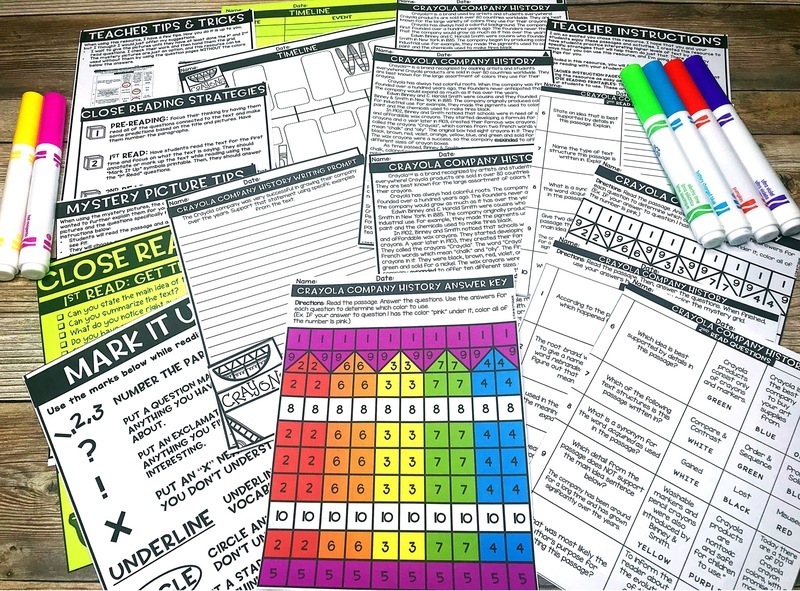 I’ve even put together a this free download (Click here) for you at the end of this post so you can try them out. If it isn’t near a holiday, choose topics that are of interest to your students. You know them and what they like or dislike. Take their interest into account when choosing a text and it will help them stay engaged with the text throughout the close reading process. Some of the topics I’ve found that were most interesting to my students were about sports, technology, candy, video games, and even passages about our body. Just talk to your students and figure out what they like. They will be more engaged with the text if it’s something they are interested in. Tell me how many times you read something that doesn’t interest you. I know I definitely wouldn’t want to read it more than once. Choice is sometimes such an easy way to engage students that I often forget about it. I feel I already have a good handle on what they like but offering them a choice helps to build interest in the text. Offer two topic choices and allow them to decide which they will work on. 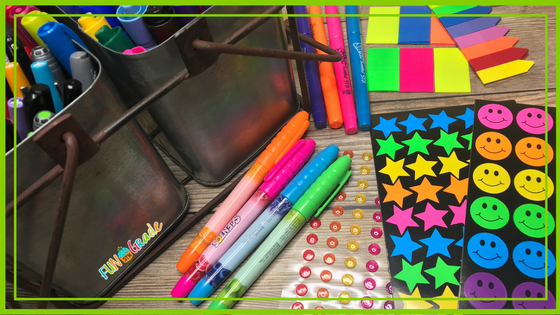 Let them choose whether they use highlighters, colored pencils, or markers to annotate. Allow them to decide how they will show what they learned in the passage. Any little bit of choice that you can offer them will up your engagement and will excited to work! Annotating isn’t always the most engaging activity so mix it up by by allowing them to react to the text in different ways. 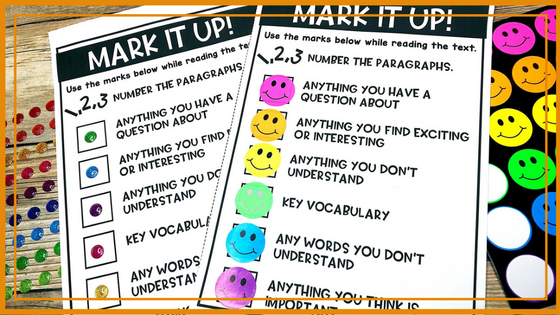 First start with the most basic annotation marks until they get the hang of close reading. Then offer them other ways to annotate the text. Maybe they could put their annotations with sticky arrows, or stickers to show how they are relating to the text. Check out the picture below to see annotation options to use to have students interact with the text. I’ve also included them in the free download (Click here). Close reading is not meant for students to do every step on every passage they read. I believe it is very important to allow them reading time where they choose the book and don’t have to do anything extra to do with it but read. I allow time for this every day. Close reading practice is important because it will help students have strategies to use when they have to tackle complicated text. It will help them to better understand text and give them options for when they don’t understand what they are reading. It is not something they will do when reading for pleasure. If you do it all the time, students may get bored and develop negative feeling for reading. My students LOVE mystery grid pictures! They didn’t love close reading. That’s why I created high interest passages that covered important reading skills while incorporating mystery grid pictures to keep them engaged. 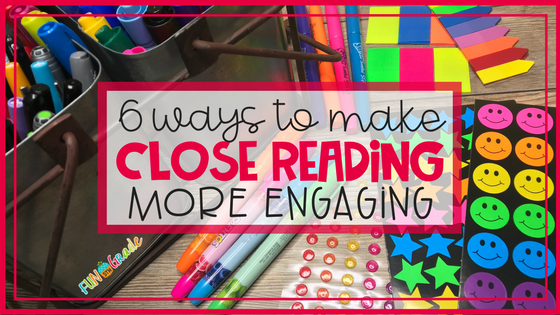 My Holiday Close Read Passages will help you tackle the difficult task of engaging students with close reading. Your students will learn new and interesting facts about the holidays. Each passage comes with a mystery grid picture for students to complete after the 2nd or 3rd read of a passage. Click here to sign up to get the free sample passage pictured below. Each set come with 3 high interest passages about the holiday. There are 2 nonfiction and 1 fiction text having something to do with the holiday. Each of the 3 texts come in 3 different levels for you differentiate to the needs of your students. the second read. Also includes a version for using the passages without the mystery grids if you’re short on time. Each passage comes with a text dependent writing prompt for students to complete after reading the passage multiple times. 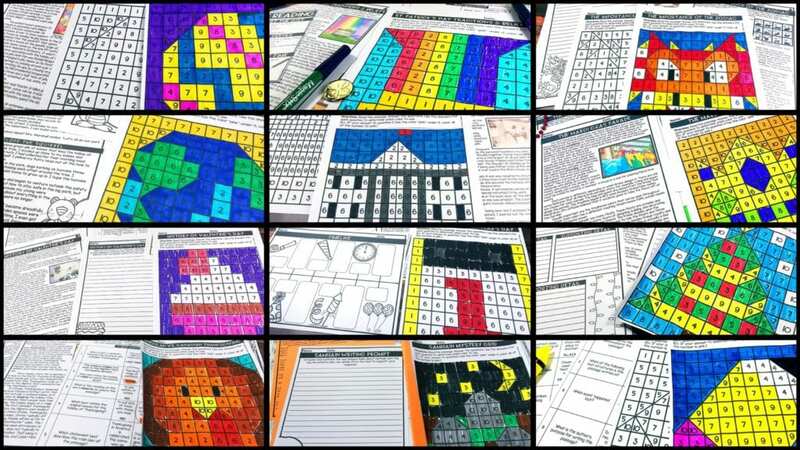 Each passage also includes a mystery grid picture meant to be completed after the 10 text dependent questions are answered. Students use their answers to determine how to color the grid. 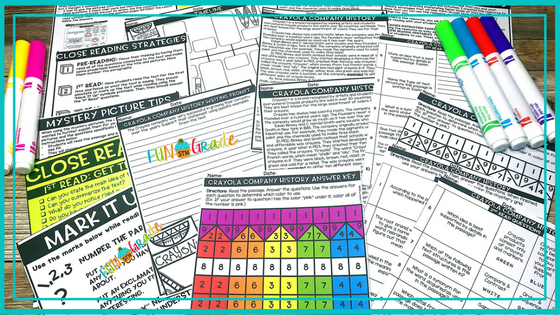 Each set includes student printables, teacher pages, and graphic organizers. *You can check out all of the sets of Mystery Grid Close Reads available by clicking here. 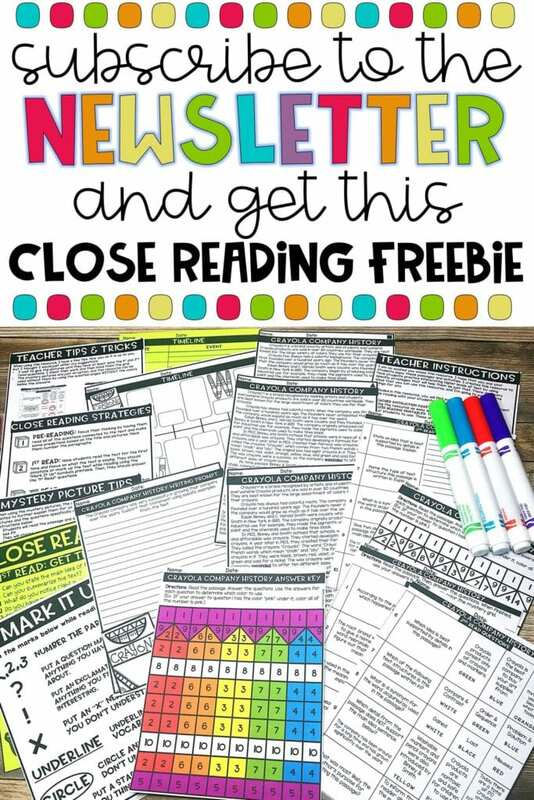 Get the close reading freebie.